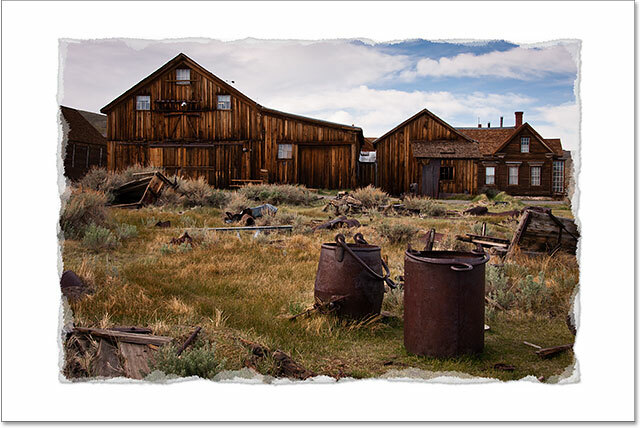 In this Photo Effects tutorial, learn how to take the normally sharp, straight edges of an image and make them look all worn, torn and faded, as if the photo is much older than it really is. Now updated for Photoshop CC and CS6. 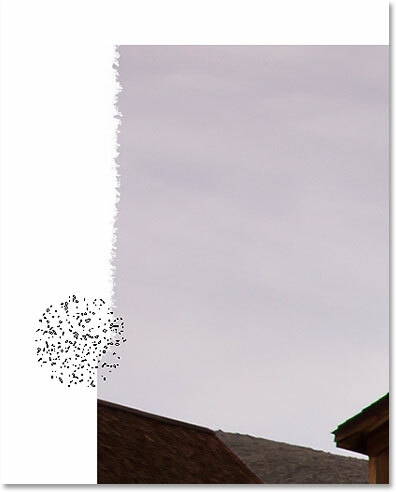 Creating the "worn, torn photo edges" effect is easy. All we need are a few layers, a couple of layer masks, some layer styles and one of Photoshop's built-in brushes! As always, I'll be covering every step along the way. This version of the tutorial has been fully updated for Photoshop CS6 and Photoshop CC (Creative Cloud). 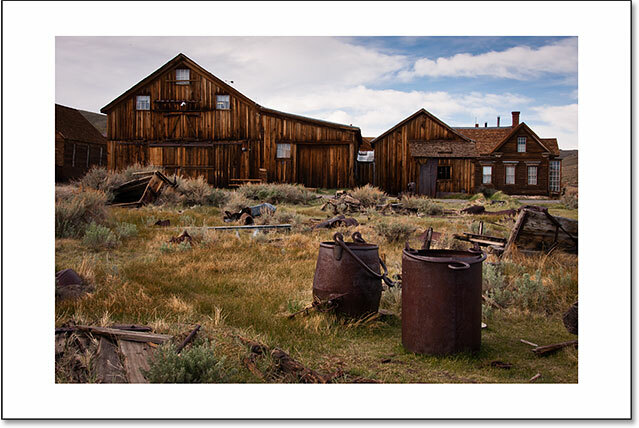 If you're using Photoshop CS5 or earlier, you'll want to check out our original Worn, Torn Photo Edges Effect tutorial. Layer 1 now appears above the Background layer. Clicking the New Layer icon while holding Ctrl (Win) / Command (Mac). The newly added Layer 2. Setting the Contents (Use) option to White. The preview thumbnails show us the contents of each layer. Clicking the Brush Presets button. Choosing Large List from the menu. Selecting the 100 px Rough Round Bristle brush. We'll be using our brush and our layer mask to hide some of the edges around the photo, but to do that, we'll need to be painting on the layer mask with black. 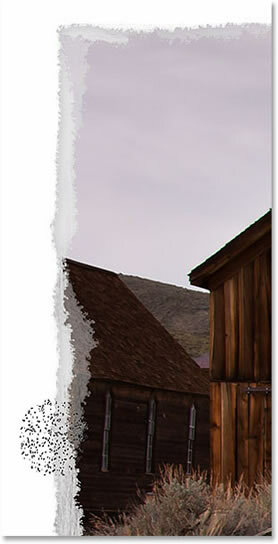 Photoshop uses the current Foreground color as the brush color, so lets quickly set the Foreground color to black. The Foreground (upper left) swatch should be black. Painting a short stroke downward from the upper left corner. 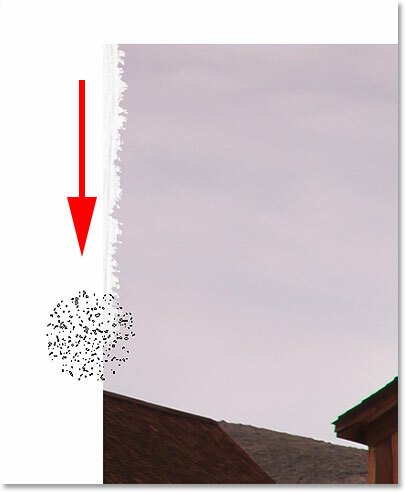 Painting over the same area repeatedly until the edge is gone. If you find that the default brush size is either too large or too small for your image, you can change its size from the keyboard. Pressing the left bracket key ( [ ) repeatedly will make the brush smaller; the right bracket key ( ] ) makes it larger. Continuing down the left side of the image. 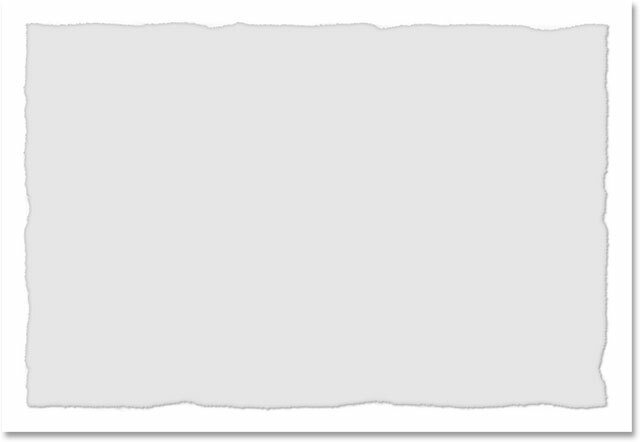 A copy of Layer 1 appears above the original. Clicking on Layer 1 to make it active. Choosing a Color Overlay layer effect. 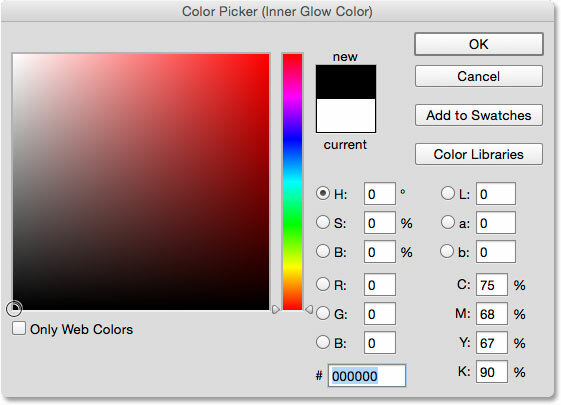 Choosing a light gray from the Color Picker. The image after applying the Color Overlay effect. Selecting the Inner Glow style by clicking on its name. 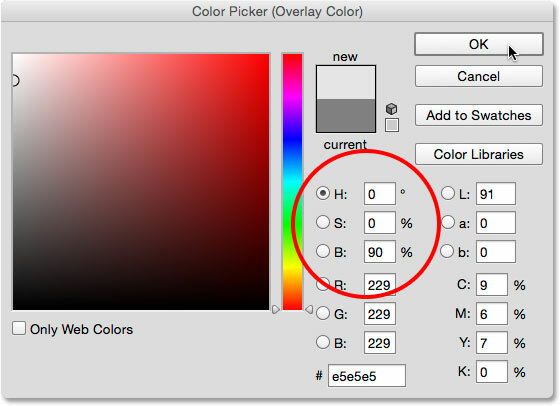 Changing the Blend Mode to Multiply and clicking the color swatch. Changing the color of the Inner Glow to black. Lowering the Opacity and increasing the Size values. The edges now appear darker after applying the Inner Glow effect. 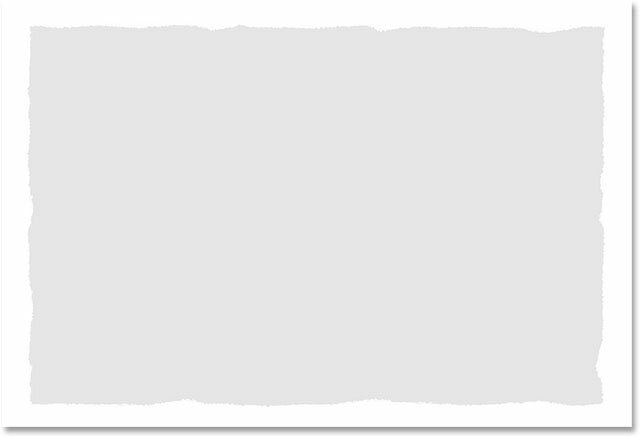 Selecting the Drop Shadow effect by clicking on its name. The image after applying all three layer effects. 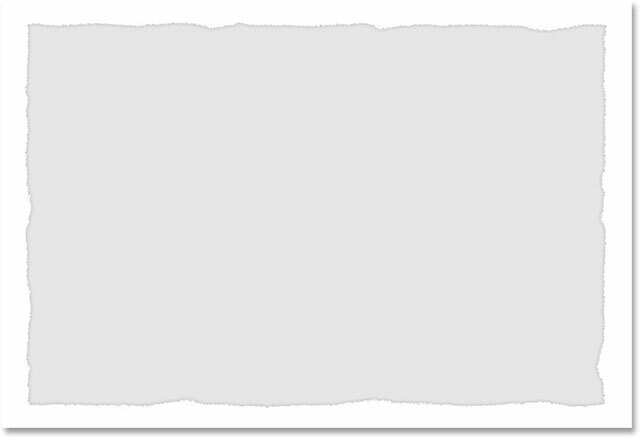 Clicking the empty square to turn the top layer back on. Painting away more of the edge. Again, you can change the size of the brush if needed by pressing the left bracket key ( [ ) to make it smaller or the right bracket key ( ] ) to make it larger. If you make a mistake, press Ctrl+Z (Win) / Command+Z (Mac) to undo your last brush stroke, or Ctrl+Alt+Z (Win) / Command+Option+Z (Mac) to undo multiple strokes. The edges are really starting to look worn out at this point. Lowering the opacity of the brush to 50%. Painting over random areas to fade them. Worn, torn and now faded edges. Going to Image > Trim. Selecting "Top Left Pixel Color" in the Trim dialog box. And there we have it! That's how to easily add wear and tear to your photo edges with Photoshop! 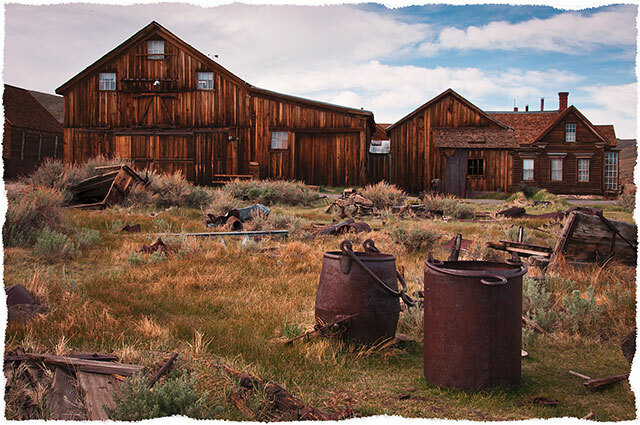 For added interest, try combining this effect with our tutorial on how to turn a new photo into an old photo or how to create an old antique photo effect with Photoshop's Camera Raw filter! Or, check out our complete Photo Effects section for more Photoshop effects tutorials!